Bode Miller finishes second at the World Cup men's super-G at Kitzbuehel, Austria. There were really no surprises when the U.S. Ski Team announced its squad for the Sochi Olympics: Mikaela Shiffrin was on the list and, of course, Lindsey Vonn was not. 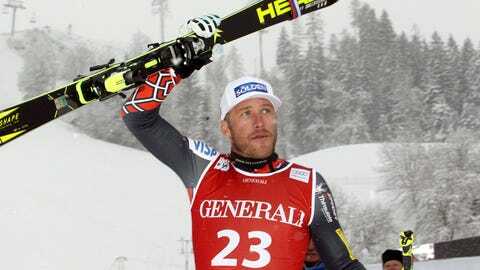 Five-time Olympic medalist Bode Miller made his fifth squad Sunday, while 2006 Olympic gold medalists Ted Ligety and Julia Mancuso also earned spots. In all, the Americans had nine women and 11 men on the team. Shiffrin could be the headliner in Russia, especially with Vonn, the reigning Olympic downhill champion for a few more weeks, staying home to recuperate following another operation on her right knee. The 18-year-old Shiffrin is having quite a season, too, winning three World Cup slalom races. She will be heavily counted on to help the Americans try to top their record eight-medal haul in Vancouver four years ago. Too much pressure for someone so young? Vonn was trying to get back to the slopes in time for Sochi after tearing two ligaments in her knee during a high-speed crash at the world championships last February. She was ahead of schedule, too, before re-injuring her surgically repaired ACL in a crash during training in November. Undeterred, Vonn rested the knee and still hoped to make it back, but sprained her MCL racing a downhill in France on Dec. 21. She later decided to undergo another surgery. Losing Vonn has been a big jolt to the team. Not only because she’s a four-time overall World Cup champion and has won 59 races on the circuit, but because the U.S. speed team members use her to measure their progress. She’s their most dynamic training partner and when she missed most of the early season preparation period to rehab her knee, it may have contributed to the team’s slow start this season. But they’re picking up steam with Sochi drawing near. Mancuso definitely feels ready after finishing seventh over the weekend in a downhill in Cortina d’Ampezzo, Italy. ”This puts me in a good spot for the Olympics,” said Mancuso, who captured two silver medals in Vancouver. Same with Stacey Cook, who finished tied for fifth in Cortina. Miller is rounding back into form as well, taking second during a super-G race in Kitzbuehel, Austria, on Sunday. Miller was away from competition for 20 months as he recovered from micro-fracture surgery on his left knee. It’s an injury that could’ve ended his career, but he will be in the starting gates in Russia, with the intention of skiing numerous events. He’s coming off his most successful Olympics, winning a medal of every color in Vancouver. Other members of the team on the men’s side include: David Chodounsky, Erik Fisher, Travis Ganong, Jared Goldberg, Tim Jitloff, Nolan Kasper, Steven Nyman, Marco Sullivan and Andrew Weibrecht, who won a bronze medal in Vancouver. On the women’s side, the team also includes: Julia Ford, Megan McJames, Laurenne Ross, Leanne Smith, Resi Stiegler, and Jacqueline Wiles. AP Sports Writer Andrew Dampf in Cortina d’Ampezzo, Italy, contributed to this report.